Name: Meet & Greet at One Florida Bank! Join us from 5-7pm on April 18th for refreshments and fellowship. 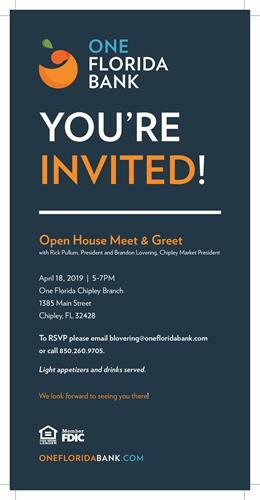 Come visit with Rick Pullum, President of One Florida Bank from Orlando, Brandon Lovering, Market President for NW Florida, and other members of this great team. We look forward to seeing you there. Please RSVP to Brandon Lovering at blovering@onefloridabank.com.